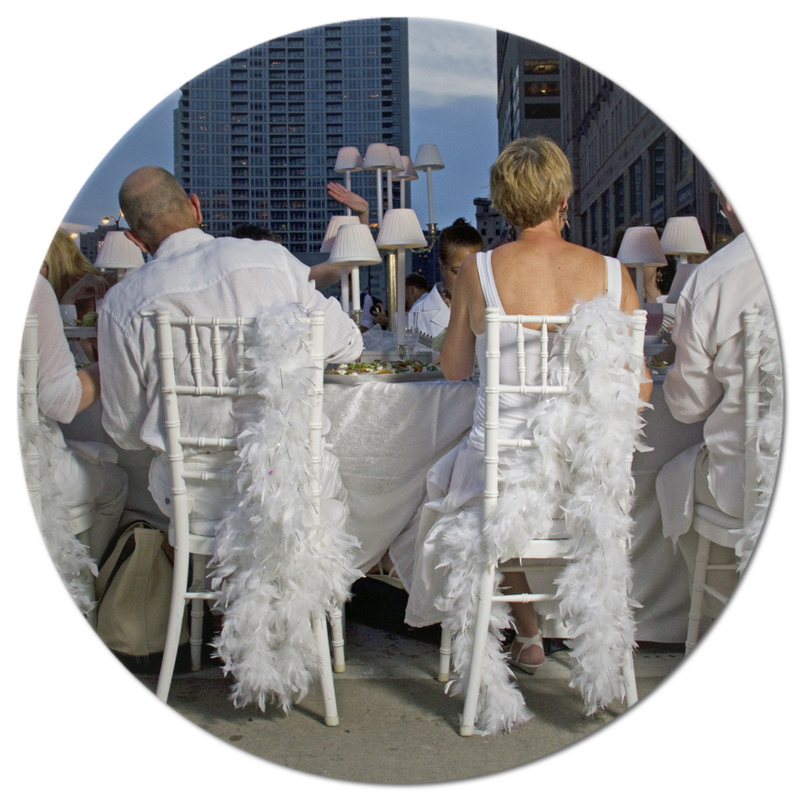 Chicago's original pop-up dinner party dressed in white. In 1893, Chicago introduced the “City Beautiful” aesthetic movement to the world. The idea was that beautification of a city in a classical and elegant tradition would increase quality of life. Once a year, for a few short hours, Daniel Burnham's vision comes back to life as hundreds gather in an elegant yet whimsical celebration of all that is good about Chicago. Much like the sparkling - yet temporary - buildings that Burnham designed, our guests temporarily appear in an open space in AND AROUND our beloved city, dressed in white. Influencers and partners make each Pop-up event distinct and memorable! WATCH OUR FACEBOOK PAGE FOR UPDATES, AND SIGN UP FOR OUR MAILING LIST BELOW! Sign up with your email address to be one of first to find out news about our 2017 event. Jen is Co-founder and COO of Chicago in White. She is the founder of Dayhouse Coworking, a woman-focused coworking + childcare space opening in Highland Park, IL in summer 2018. A fifth generation Chicagoan, she is a former freelance writer, blogger, and editor specializing in food, home entertaining, and fashion — all of which come together for Chicago in White! Jen is a member of the Junior League of Chicago, the Chicago Symphony Orchestra Women's Board, and currently serves as Vice-President of the Ravinia Festival Associates Board. She lives on the North Shore with her husband, daughter, and two slightly crazy dachshunds. Kelly is Co-founder and CMO of Chicago in White. She’s been involved with Chicago in White since its inception. and loves this project because her passions include cooking and throwing a great party. Professionally she works in the marketing technology/SaaS industry and adopted Chicago as her home over 25 years ago. Kelly is Vice President of Business Development, Enterprise for DAC group. She previously worked at companies such as 360i (Dentsu), IgnitionOne, iCrossing, LinkShare., and Leapfrog Online. In addition to her professional pursuits, Kelly is a member of the Junior League of Chicago and Union League Club of Chicago and Jack and Jill. Kelly is a widow and raising two daughters Chelsea and Lindsay, and Brutus, a 180 lbs. Neapolitan Mastiff. Each year Chicago in White selects a handful of local influencers and partners to be a preferred partners for all things related to the event. Partner categories include social media, and in-store experiences, fashion, shoes, flowers, food & wine baskets, gourmet desserts, and event sponsors. To learn more and to be considered for 2018, please contact us. Are you interested in helping volunteer? Each year a select group of Chicagoans participate in aspects of planning and execution of our annual event. The Chicago in White team hosted our first event in 2011 with over 1,100 Chicagoans in attendance. Guests made their way to iconic Daley Plaza dressed in white, with elegant accoutrement in tow. There, they enjoyed 3-course meals of everything from chicken curry to filet mignon and danced to the sounds of a gypsy jazz band. "Whimsical" and "enchanting" best describe the sensibility of our inaugural event, and every event since.